Hi there, My name is Lesley. I am married, and a mom to 4 children.I was diagnosed with Stage 3 high grade serous ovarian cancer on July 12 and it has been a whirlwind ever since. 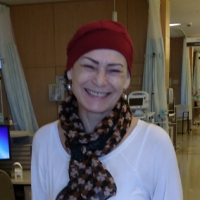 My sister fought the same battle in 2005 and survived, cancer-free for 13 years. She died of unrelated complications recently. I am going through the usual motions. "What could I have done to be diagnosed sooner? Why didn't my doctor catch this sooner? How can I make sure my sister, daughter and nieces don't have to fight this battle in the future?" I work very hard to stay positive and have a really wonderful support group of family and friends, but I think it would be great to speak to other people who are going through this. I have been researching things online and it is really important to stay to reputable websites. As well, I find that I don't research anything in the days following chemo. I am usually more tired, feeling more vulnerable and crappy. I only ask questions and research during the week or so that I am feeling strong and healthier. Any advice is welcome. Hello @Lesley66-Welcome to the site and thank you for sharing your story. We hope you will find much support here to help you with those worries we are sometimes thinking about. Hope you are feeling ok and we invite you to view through the previous chat topics to see how other women have coped. Yes, you can find some great resources on the home page https://ovariancanada.org/....... I'll also private message you. @Lesley66 ; Depending on their ages I would discuss with your family members having the ovaries removed if you can. Best preventive measure around. Some women have mastectomies so why not have ovaries removed. I assume the idea of close monitoring is also available. CA 125 test periodically and transvaginal ultrasounds to watch for it. Your doctor could help there along with the genetic testing for the BRCA gene mutation to see if it is relevant. Good luck. Hi my name is Violet, I'm a 10 year survivor, both breast and Ovarian. First breast in Nov. 2007. Feb.2008 I had pain on my left side and it was discovered that I had a 10 cm mass on one of my Ovaries, I asked my Gyno to go ahead with a hysterectomy since I didn't want any future complications. During surgery it was discovered that I had Ovarian Cancer. I was referred to PMH, there I learned it was stage 3 and I started chemo right away with Carbo/Taxol, it was horrible with so much bone pain. I was symptom free for over 5 years and unfortunately it came back with a vengeance, it was on my bowel, liver, and diaphragm. My oncologist suspected BRCA since I had 2 primary cancers so close together. I'm BRCA2. I had major surgery and was hospitalized for 5 days, the recovery was hard. I then received 6 chemo treatments with Gemcitabine. One year later they discovered another tumor and I was referred to a clinical trial for (Parp Inhibitor Olaparib) Unfortunately for me I was randomized to get chemo rather than the drug. I received treatment with Caelyx (doxorubicin) for a whole year, I had so many complications I stopped treatment, it was literally peeling the skin of my feet and hands. The drug caused so much damage on my big toes, it caused the nails to die and peel off, they did grow back but I had to have surgery since it caused ingrown nails. In Nov 2018 they discovered another tumor on my vaginal cuff/bowel and I have been scheduled for another surgery on Feb.8th. It was decided it would be best to remove the tumor, I would then do minimum 4 chemo treatments and then I would qualify for the new drug Olaparib. I'm mad as hell but the opportunity that this new drug is available to us gives me hope. I was happy to read some of the comments from woman that are presently taking it that have had success with little side effects. I'm on Letrozole for my breast cancer, I had a left breast mastectomy May of last year and I'm tolerating the drug well. Fingers crossed I have the same result with Olaparib. Finally they are coming out with at least something for us battling Ovarian Cancer. Hello @Vi4 - we are glad you have found this chat site and so appreciate you telling your story. It speaks of hope, appreciation and resiliency. Good to know they have a plan of action for you. Yes, do look at the topics throughout the site as there are several pages of topics and lots of comments on each, including the clinical trials and Olaparib and Lynparza page. Wishing you a good outcome for that upcoming surgery. Thank you, lots to check out.